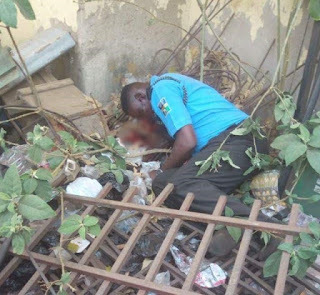 The family of ASP Julius Ayesanmi, one of the policemen slain by robber in Offa, Kwara state recently have called on the government to help them. On Thursday, April 5, 2018, robbers attacked Union Bank, Eco bank, Guarantee Trust Bank, First Bank, Zenith Bank and Ibolo Micro Finance Bank and made away with an unspecified amount of money, according to NAN. The heavily armed robbers attacked Owode Police Station where they killed the policemen and some complainants before they raided the banks. Ayesanmi was among the officers killed in the police station on that fateful day. According to the family of the slain police officer, he had one year left for him to retire from the police force. Ayesanmi’s son also alleged that the Divisional Police Officer (DPO) in charge of the station did not come to condole with them. The Federal Government in a tweet from the handle @NGRPresident, sympathised with the family members of those who were killed during an armed robbery attack. According to Gov. Rauf Aregbesola of Osun state, who described the robbery attack as barbaric and unfortunate, said no effort should be spared to bring the perpetrators to justice. The governor also called on security agencies at various levels to launch a thorough investigation to unravel those involved in the incident. Meanwhile, the Governor of Kwara state, Abdulfatah Ahmed has called on the people of the state not to politicise the Offa robbery incident.